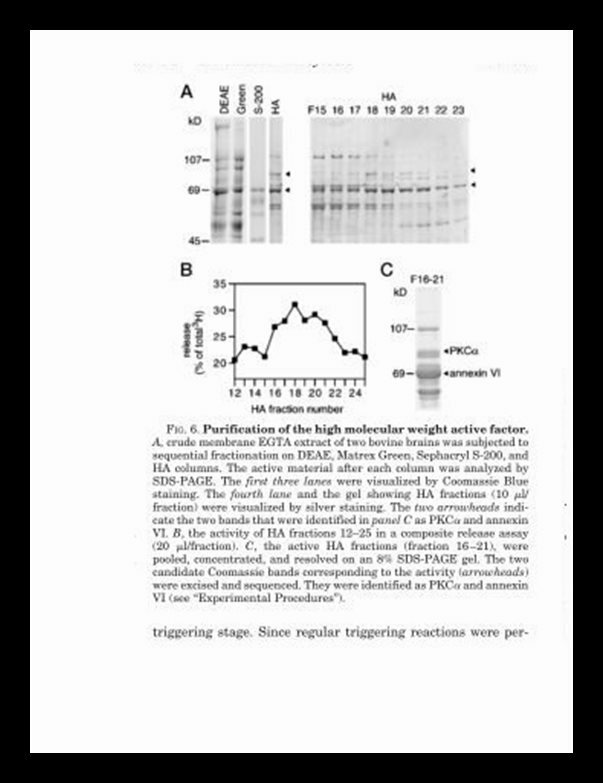 J Biol Chem 1999; 274(37): 25469-26476.
are enriched in an EGTA extract of brain membranes. in the absence of any other cytosolic proteins. confirmed using commercial and recombinant proteins. but not calmodulin mediated stimulation. 3 nM PKC and 75 nM calmodulin. “advertisement” in accordance with 18 U.S.C. Section 1734.
is thought to comprise the basic fusion machinery (4, 5). earlier processes which replenish the pool of readily releasable vesicles (6). The molecular mechanisms by which Ca2+ regulates these processes is not well understood. they offer a homogeneous cell population that possesses the same basic exocytic machinery as neurons (8). then reconstituted for secretion of NE in the presence of test proteins (9). while cytosolic proteins leak out (10). all essential components are added into one reaction mixture. reconstituted for NE release with cytosol and Ca2+ (11). whether its effect is dependent on Ca2+ or ATP. electro-physiological systems that monitor release in vivo. It provides information on protein functions in a cell with an intact membrane infrastructure while being easily manipulatable. 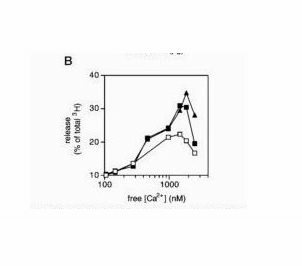 intra-cellular Ca2+ concentration can be controlled by a buffered solution. direct readout of [3H]NE released into the buffer. exo- and endocytotic signals are also eliminated as only one round of exocytosis is measured. added compounds do not need to diffuse long distances along axons and dendrites to their sites of action. calcium-dependent activator protein for secretion (CAPS) (9). both proteins involved in membrane trafficking (15, 16). calmodulin binding inhibitory peptides (22) inhibited Ca2+-activated exocytosis. thus suggesting an essential role for Ca2+/calmodulin in constitutive intracellular membrane fusion (24). has been shown to potentiate neurotransmitter release (26, 27). Another Ca2+ signaling molecule, PKC, has also been implicated in regulated exocytosis. the phorbol esters stimulate secretion (28, 29). that it increases the Ca2+ sensitivity of the membrane trafficking apparatus (36). no consensus on these issues has been reached. leads to the enhancement of exocytosis. a calmodulin-dependent pathway by synchronously releasing calmodulin from storage proteins. calmodulin and PKC play a role in the Ca2+ regulation of exocytosis, and provide further insight into the mechanisms of their action. capable of reconstituting Ca2+- activated exocytosis in cracked PC12 cells. it served as an efficient initial purification step. which together accounted for about half of the starting activity. that calmodulin and PKC mediate aspects of Ca2+-dependent processes in exocytosis. in PC12 cells is somewhat surprising. We suggest that the likely explanation is 2-fold. within permeabilized cells, whose activity might be sufficient for a normal level of exocytosis. 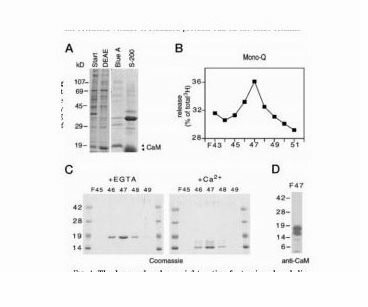 Ca2+-independent manner are probably present in the membrane EGTA extract. are quite different to that of cytosol (Fig. 2). they signal through membrane-attached molecules to increase exocytosis. at about 75 nM for calmodulin. calmodulin and its substrate protein. as in triggering steps (49, 50). does not allow Ca2+-dependent priming events to be assayed, as EGTA is present in the priming reaction. a different approach revealed the existence of both high and low Ca2+-dependent processes (Fig. 2). while Ca2+-dependent priming events occur further away from the point of Ca2+ entry. Distinct Ca2+ sensors at these stages might be appropriately tuned to different [Ca2+] to handle different tasks. whether calmodulin and PKC plays an early or a late role in vesicle release. release sites, or an enhancement of the probability of release of individual vesicles upon Ca2+ influx. a drop in release at very high [Ca2+]. the true Ca2+ sensitivity of the Ca2+-sensing mechanism inside cells. However, in our system, it could also be due to the activation of a variety of Ca2+ -activated proteases, as experiments are usually performed in the presence of crude extracts, which include unsequestered proteases. What might the molecular targets of PKC and calmodulin be? 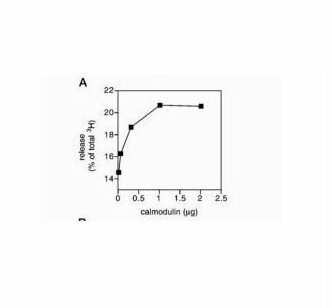 An obvious calmodulin target molecule is CaMKII. but calmodulin’s effect on exocytosis is ATP-independent, rendering the involvement of a kinase unlikely. probably by binding to its C-terminal tail (55), and to promote Rab3A dissociation from synaptic vesicles (56). or in a calmodulin overlay (data not shown). significant Ca2+-dependent pull-down of synaptotagmin or Rab3A from rat brain extract (data not shown). Recent work has suggested three other candidate targets for calmodulin, Munc13, Pollux, and CRAG (57). CRAG is related to Rab3 GTPase exchange proteins. Further work is required to investigate the role of their interactions with calmodulin in vivo. may mediate many membrane trafficking events. the effector molecule of calmodulin is conserved or variable across species and different trafficking steps. calmodulin is a high affinity Ca2+ sensor for both constitutive and regulated membrane fusion. In the case of constitutive fusion, calmodulin may be the predominant Ca2+ sensor. the concerted actions of other molecule(s) that are better tuned to intermediate rises in [Ca2+] might exist. in addition to calmodulin to achieve membrane fusion. the impact of Ca2+ sensing by calmodulin on vesicle release likely varies. PKC action on exocytosis proceeds through a calmodulin-dependent pathway. that functions as a calmodulin storage protein. we have extended our knowledge of the release process. the multiple effects of Ca2+ on exocytosis remain to be elucidated at the molecular level. resuspended in potassium glutamate buffer containing 0.1% bovine serum albumin. released [3H]NE was quantified by scintillation counting (Beckman LS6000IC). was calculated as a percentage of total [3H] in the supernatant. the protein solution to be tested. as in a composite assay. was added into the triggering reaction. NE release was measured as above. 0.8, 1.0, 1.2, 1.4, 1.6, 1.8, 1.9, and 2.0 mM. in the absence of protein extracts or cracked cells. [Ca2+]free 5 Kd*3 (R 2 Rmin)/(Rmax 2 R) (42). based on fura-2 calibration in cell-free solutions). 106, 146, 277, 462, 971, 1468, 1847, and 2484 nM. CL-6B beads (Amersham Pharmacia Biotech). (20 mM Hepes, pH 7.5, 2 mM EGTA, 400 mM KCl, 1 mM dithiothreitol). tested in a composite release assay for activity. specifically deplete CAPS, which was known to bind to Green beads (9). Samples were run on the S-200 column in PGB at a flow rate of 7 ml/h. two peaks of activity were observed (Fig. 3). The first peak of activity had a predicted molecular mass of 85 kDa. SDS-PAGE and silver staining (Sigma silver stain kit). on an 8% poly-acrylamide gel. sequenced by the Stanford PAN facility. The only bovine protein that contains both polypeptides is PKCa. unambiguously identified to be bovine annexin VI. The second S-200 peak has a predicted molecular mass of 25 kDa. with a linear salt gradient from 0 to 1 M KCl over 71 ml. tested in the cracked cell assay. ECL (Amersham) was used for detection. reconstituted secretion in the absence of cytosol. had a higher specific activity than cytosol (Fig. 1). FIG. 1. The EGTA extract of brain membranes can support NE release in the absence of cytosol. 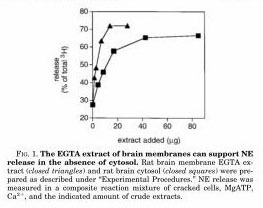 Rat brain membrane EGTA extract (closed triangles) and rat brain cytosol (closed squares) were prepared as described under “Experimental Procedures.” NE release was measured in a composite reaction mixture of cracked cells, MgATP, Ca2+, and the indicated amount of crude extracts. devoid of most membrane EGTA-extractable factors. participate in Ca2+- triggered exocytosis. proteins can be tested for activity in either stage. an effect in triggering a late ATP-independent role. in the priming stage versus the triggering stage. not in the priming assay (Fig. 2A). presumably contains some of the proteins present in the membrane EGTA extract. in the triggering assay compared with regular cytosol (Fig. 2A). to identify the active components capable of reconstituting NE release. no other proteins were added to the cell ghosts except for the test protein(s). but does not bind to Amicon color resins. DEAE, Affi-Gel Blue (or Matrex Green-A), and gel filtration chromotography. predicted molecular masses of 25 and 85 kDa, respectively (Fig. 3). FIG. 3. Gel filtration chromatography reveals two stimulatory factors in the membrane EGTA extract. 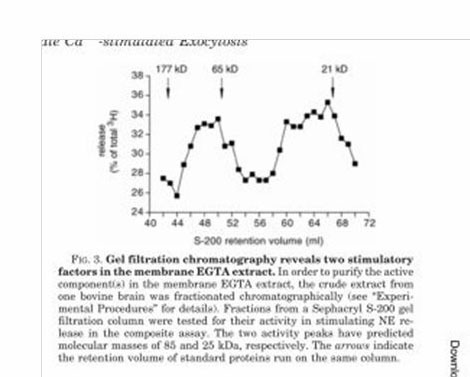 In order to purify the active component(s) in the membrane EGTA extract, the crude extract from one bovine brain was fractionated chromatographically (see Experimental Procedures” for details). Fractions from a Sephacryl S-200 gel filtration column were tested for their activity in stimulating NE release in the composite assay. The two activity peaks have predicted molecular masses of 85 and 25 kDa, respectively. The arrows indicate the retention volume of standard proteins run on the same column. Coomassie-stained SDS-PAGE gel, after a subsequent Mono-Q fractionation (Fig. 4). mobility shift depending on whether or not Ca2+ is present during electrophoresis (see panel C). (5 ml/fraction) were tested for activity in a composite assay. The activity peak is shown. and the gels stained with Coomassie Blue. 3) It stains negatively in silver stain (data not shown). absence of Ca21 (Fig. 4C). positive signal (Fig. 4D), confirming our prediction. We used commercial calmodulin or bacterially expressed recombinant calmodulin to confirm our purification result; both sources of authentic calmodulin stimulated NE release as expected. Moreover, we found that calmodulin stimulates secretion in a triggering assay as well as in a composite assay (Fig. 5A). calmodulin-stimulated secretion that we observed. FIG. 5. 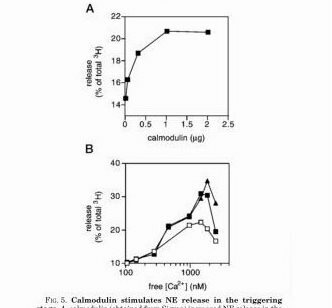 Calmodulin stimulates NE release in the triggering stage. maximal release achieved by addition of rat brain cytosol was 46.5%. and about 2% of total proteins in the rat brain cytosol (data not shown). in the washed cell ghosts (data not shown). calmodulin accounts for 13–22% of total activity of the extract. (6.7 mg of extract added; data not shown). calmodulin enhanced secretion in an ATP-independent fashion. which blocks ATP-dependent enzymatic activity (Fig.8A). Therefore, we ruled out the possibility that a kinase mediates calmodulin’s effect. an ATP-dependent and ATP-independent manner respectively. 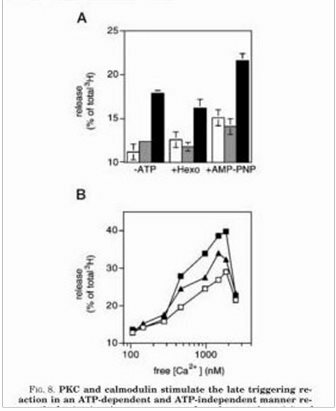 in the cells, hexokinase-based ATP depletion was employed (1Hexo). from Calbiochem; closed squares), or buffer only (open squares). none of the mutations abolished the calmodulin effect (data not shown). within chicken calmodulin (46, 47). naturally occurring mutations that result in aberrations in their behavior. (calmodulin C-terminal lobe mutants: S101F and M145V) (45). defining calmodulin’s binding specificity (46, 47). could be completely abolished by addition of exogenous syntaxin H3 domains (data not shown). the same molecular pathway was not activated, since their effects were additive (data not shown). thank Dr. Jesse C. Hay for the initial setup of the cracked cell assay, and Dr. Suzie J.
Scales for helpful comments on the manuscript. a major transport system in our cells. Specificity in the delivery of molecular cargo is essential for cell function and survival. Lichtstein’s main research focus is the regulation of ion transport across the plasma membrane of eukaryotic cells. and neurological and psychiatric diseases. As part of our CALCIUM Series??? This brings back memories of working in the Thorner group, back in the 1980’s. We would videotape a microscopic field of rat anterior pituitary cells loaded with Fura 2-AM; administer nanomolar levels of CRF or AVP (in the experiments I did), then quantify ACTH secretion; and correlate that with calcium rises. The cells were bathed in a calcium containing buffer, and alive. 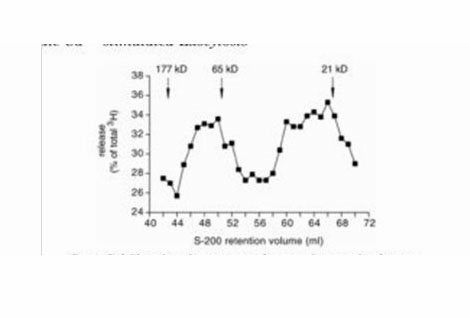 Interestingly, the two secretagogues had different intracellular calcium dynamics: CRF was slo to rise, then fall (roughly a square wave); whereas AVP -linked to the IP3 pathway, had a sharp, fast increase, followed by an exponential decline..